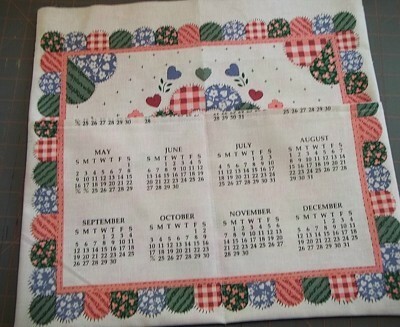 I have an abundance of calendar tea towels in my linen closet. They were picked up at auctions, yard sales, and I have been occasionally gifted with one. I never really use them for a calendar or a tea towel, but as a lover of all things made of fabric, I can't get rid of them. I loved the graphic designs and the vintage colors. 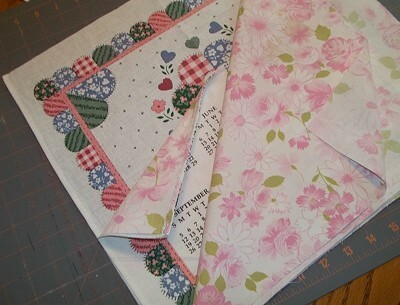 Paired with a bed sheet for the lining, I decided they would make great thrifty aprons for family and friends. 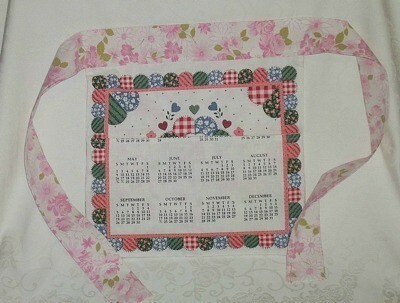 The year of the calendar does not show, eliminating the dilemma of who should own the apron and why. 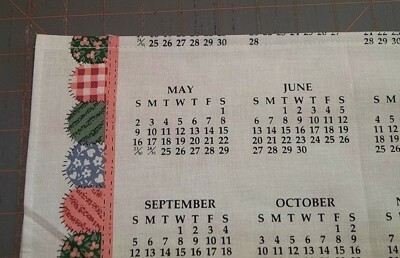 Cut off the top casing and the bottom hem of your calendar tea towel. The hems on the side edges are not cut off. Measure up 9 inches from the bottom edge of the towel and cut across the width. The bottom portion is the apron pocket and the top portion is the apron body. 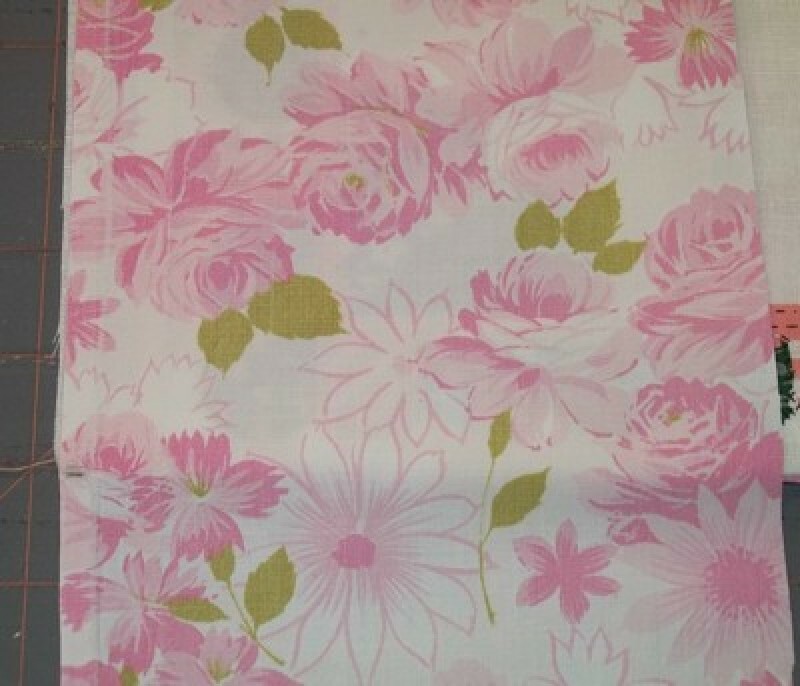 Using the calendar pieces as your pattern, cut one pocket lining and one body lining from a coordinating bed sheet. Cut a 6-inch wide by 60-inch long strip from the bed sheet for the waistband and ties. Place the pocket and the pocket lining together with the right sides facing. Pin the long top edge together. Sew the pinned edge using a 1/4-inch seam allowance. Flip the pieces with the wrong sides together and press. Top stitch along the top edge 1/4 inch from the edge. Lay the calendar apron body on your work surface with the right side facing up. Place the pocket on the body, matching the body edge of the pocket with the bottom edge of the body and lining up the side edges. Place the lining of the apron body on top with the wrong side facing up. Line up the edges and pin the side edges and the bottom edge together. Sew the pinned edges using a 1/4-inch seam allowance. Do not sew the top edge of the apron. Clip the bottom corners to eliminate bulk. Turn the apron right side out through the opening on the top edge. Press the apron flat. 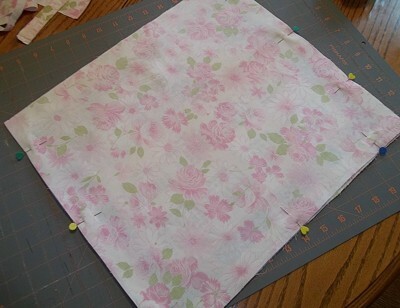 Sew down the center of the large pocket to create two compartments. Lay the apron with the front facing up. Place the waistband strip across the front of the apron with the wrong side facing up. Line up one long edge of the waistband with the top edge of the apron. Match the center of the long edge with the center of the apron's top edge. Mark the top edge of the waistband at each side edge of the apron. The waistband is not attached at this time. Fold the waistband strip in half with the right sides facing and the long edges matching. Pin the long edges and the short ends. Do not pin between the markings on the center of the waistband. Sew the pinned edges and the end of the waistband using a 1/4-inch seam allowance. Do not sew between the markings. Clip the corners and turn right side out. Press the waistband. Lay the apron with the back facing up. Place the stitched waistband across the back of the apron. Line up the opening in the waistband's edge with the top edge of the apron. Pin the back raw edge of the waistband's opening to the apron's top edge. Sew the pinned edges using a 1/4-inch seam allowance. Lay the apron with the right side facing up. 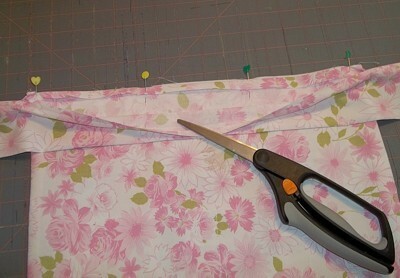 Lay the remaining raw edge of the waistband over the front of the apron's top edge. Fold the raw edges under a 1/4 inch and pin, covering the stitches from the back edge of the waistband. Top stitch over the pinned edge and the length of the ties extending from each side of the apron.